Climate conditions continue to play a decisive role in the prospects for harvesting and processing in the Mediterranean basin. Significant delays in campaign start-ups or crop development suggest that a larger than usual part of the harvest could be pushed back to the "at-risk" periods of September and October. These considerations, and certain special circumstances (climate, health pressure, market situation, etc.) 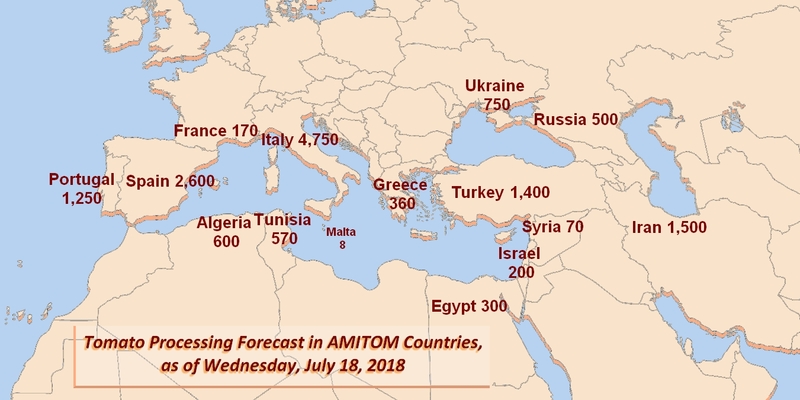 led several industries in the Mediterranean region to revise their forecasts: the total forecast on 18 July for all AMITOM countries was 15.03 million metric tonnes, down 3% from the June forecast, 5% from the initial intentions (15.82 million mT) announced in January and February of this year and 9 % compared to the final result of 2017 (16.45 million mT). 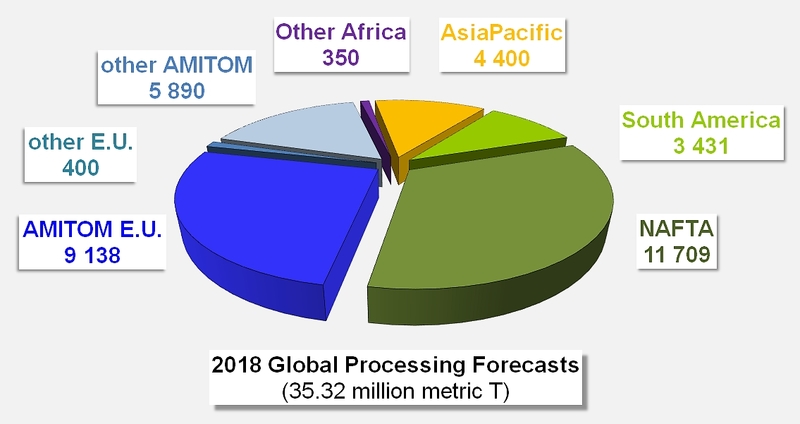 At this stage, the quantities to be processed within AMITOM represent 42.5% of global processing volumes. 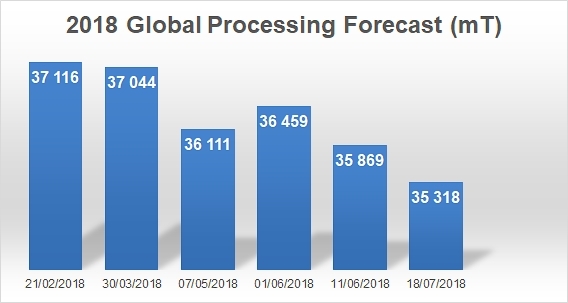 Processing forecasts in the rest of the world have hardly changed since they were examined during the World Congress last June: only China has revised its processing prospects, so that the global forecast as of July 18 was around 35.3 million metric tonnes, down 1.5% from June's estimate, 4.6% (1.8 million mT) from the initial forecast announced at the beginning of the year and almost 7% compared to the final result of 2017. There the summer is late with temperatures not exceeding 26 to 30 °C and the plants are looking good but developing more slowly. The harvest should only start on 10 August and it is expected that only 30% of the harvest will be achieved by the end of August (normally 50-55%). 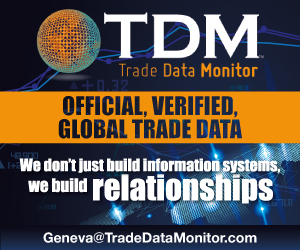 The forecast remains 1.25 million tonnes but the total volume will depend largely on the weather in September and the first week of October. There is an important delay in all the regions due to the cool weather in June and July: in Andalucía, the harvest will start on 1st August (normally 10 July) and in Extremadura on 10 August (normally 20-25 July). Moreover, the dew and high humidity due to the low temperatures increases the need for treatments. The forecast is maintained at 2.6 million tonnes but a high proportion of the crop will be harvested in September which is more risky. In the North, the situation is normal and the harvest is now starting. The surface planted is 35,000 hectares and the current forecast is 2.45 million tonnes, 10% less than in 2017. In the Centre and South, the official surfaces were released yesterday and are 2,000 hectares lower than last year. The late planting, due to the early worry about a possible drought will push a lot of the crop into September and the first one or two weeks in October and this will also reduce yields so the forecast is down to 2.3 million tonnes. 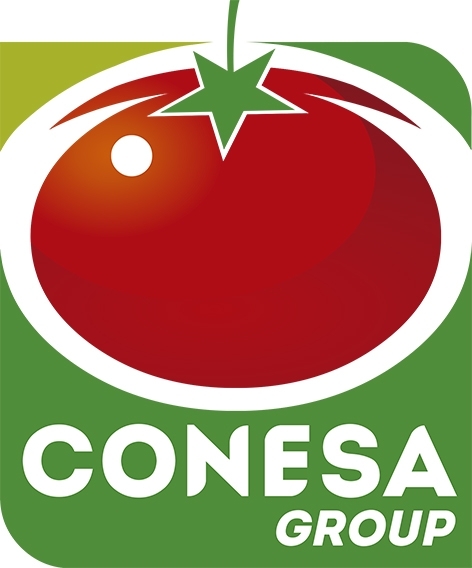 Some factories have now started processing cherry tomatoes and specialties, the main harvest will start next week for round and at the end of July for the long types. The total estimate for Italy therefore is reduced from 4.9 million tonnes to 4.75 million tonnes. The weather conditions have been bad in June and early July with many rain storms, some flooding and diseases which had led to a reduction of the forecast by 15% to 360,000 tonnes. Factories started last week in the south and should start next week in the other regions. The forecast is maintained at 120,000 tonnes despite the weather been far from ideal. The harvest started during the last week in June and 250,000 tonnes had been processed by 16 July by 23 of the 26 factories. The tomatoes come from the Centre region (Kairouan, Sidi Bouzid and Gafsa) and the Cap Bon region. The forecast remains 570,000 tonnes. The factories in the south started last week but the early quality is poor with lots of diseases. Moreover, there is strong competition at the moment from the fresh market as there is a gap in production so spot prices are high. Quality and volumes should pick up soon and the forecast is maintained at 1.4 million tonnes. The weather was good in June and beginning of July and allowed tomatoes to develop in a favorable environment. A wide spread of noctuid is the most serious insect question this season so far. The forecast remains the same (750,000 tonnes) and the harvest should start in the beginning of August. In California, the estimate is to process 724,000 short tons (657,000 metric tonnes) during the week (29). 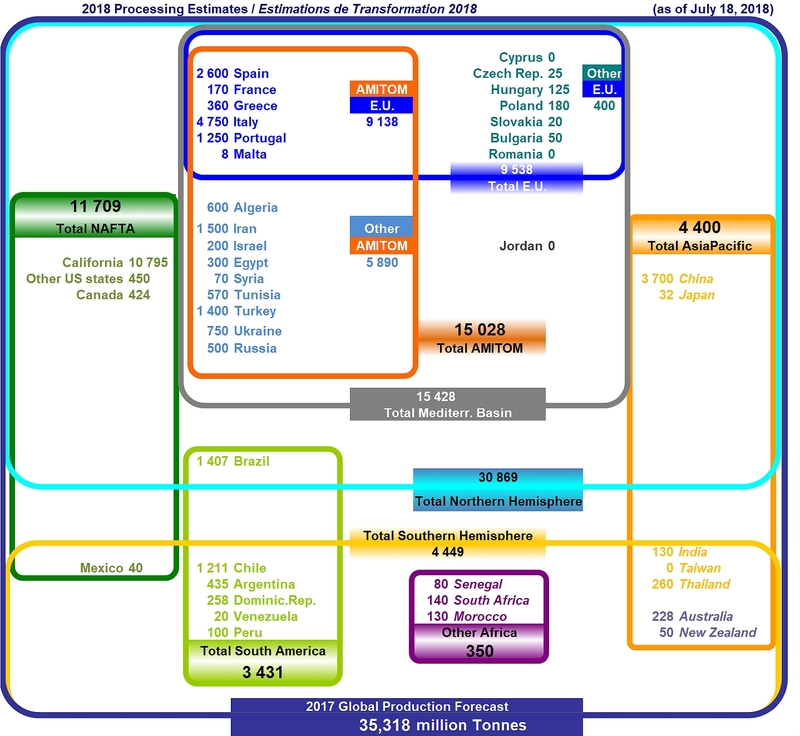 At the end of this week (July 21) the industry will have processed approximately 989,200 tons (897,000 metric tonnes). Harvest started in the first week of July. So far field yields are good and quality is meeting projections. 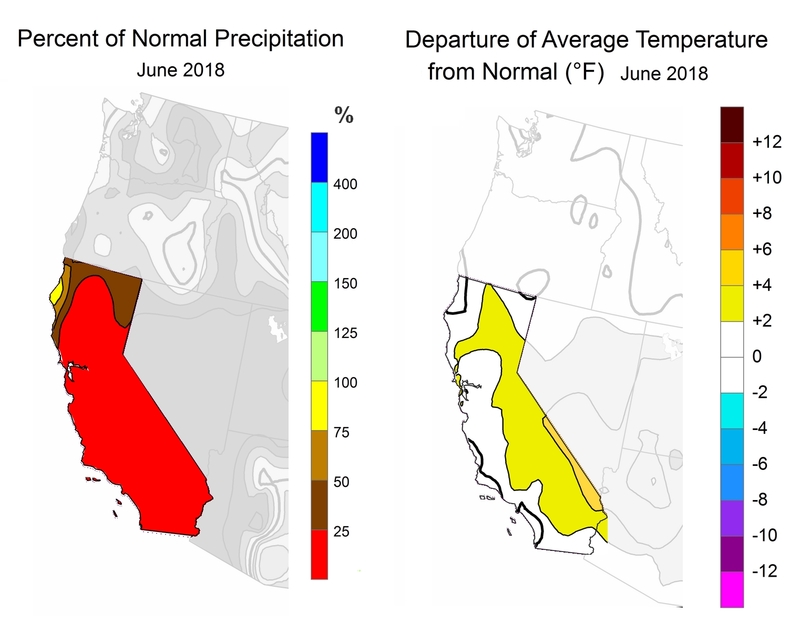 California is currently experiencing a prolonged period of above normal temperatures that the industry will be monitoring. All factories should be up and running by Monday, July 23rd. 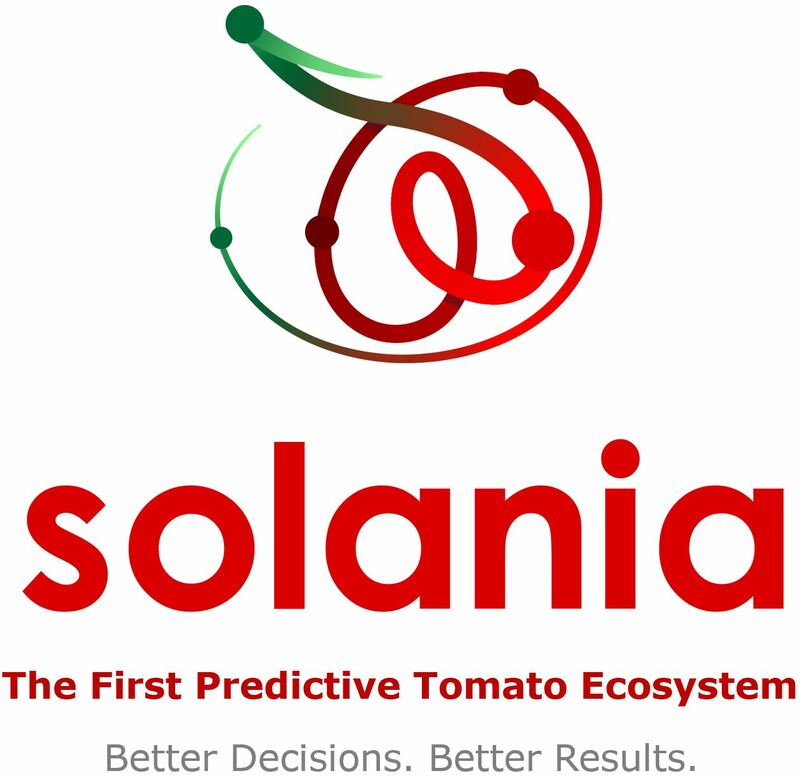 (See also our weekly articles on Tomato News’ website). In Canada, the crops are reportedly looking excellent but season has been very hot and dry. Growers hope for timely rains where crops are not irrigated. In China, as expected, the total tomatoes of China will be around 3.7 million tonnes. Current weather conditions are normal, and there is no serious diseases. Tomato plants grow well. The start time of new season will be similar to last year around early of August. In South Africa, harvest is continuing in the northern production area. The impact of white fly and side selling continue. The current projection is 140,000 tonnes. The winter rainfall area is receiving good rain and the Clan William dam is currently on 98% compare to 22% last year. Planting in the South will commence during October. The US Midwest will be starting in the second week of August and crop prospects remain good. Some areas are experiencing some excessive dry conditions but overall the crop should meet expectations. In Poland, there was good weather in May, very hot and dry June and first week of July. Drought losses in north part of Poland, much better situation in south regions. The forecast is 180,000 tonnes from 2 800 hectares, with a start of the harvest on 1st August.